A group of the young tennis devotees who took part. Seven days of uninterrupted sunshine bathed the Border Tennis Centre in Galashiels for the 2017 Borders Confined Junior Tennis tournament. Parents and competitors alike basked in gorgeous weather and energy levels for all were maintained by the sterling efforts of Lindsay Whitelaw in the Borders Tennis café. Highlight of the week, however, was undoubtedly the performances from Wilton Park LTC’s Harris Brogan and Earlston’s Felicity Walls. They both competed in five finals, each winning four of them. Harris landed the 18U Doubles, 16U Singles and Doubles, and 14U Doubles titles, with Felicity winning the 16U Singles, 14U Mixed Doubles, 14U Singles and 12U Singles. 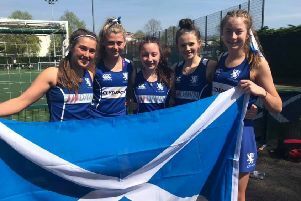 The only ‘blemishes’ on their otherwise perfect records were a defeat to Nik Stingl (Kelso) in the 18U Singles final for Harris, while Felicity and Indie Lucas succumbed to Alice MacBrayne and Kirsten Rodwell in the 16U Doubles. Selkirk LTC, usually one of the mainstays of Borders junior tennis, was very under-represented because a few boys were in Dorset competing for the South of Scotland. It was left to Daniel Main and Cameron Welsh to fly the flag for the town and both boys gave a great account of themselves, with Cameron winning the 16U Doubles. Daniel battled through to four finals, but lucklessly ended up with only runner-up medals for his efforts. In addition to Harris Brogan, Hawick & District players had another very successful event, with participation from Harris’ brother, Marcus, and the Goldie brothers, Paul and Martin (all Wilton Park LTC). They all returned with trophies and medals after a week of very solid performances. Mentions were also deserved by Lewis Watt (Borders Tennis Centre) and Adam Clunie (West Linton LTC), who, like Daniel Main, reached four finals apiece. Lewis eventually grabbed the 14U Singles and 14U Mixed Doubles, while Adam took the 12U Singles title. Organisers have thanked everyone for their participation this year and made special mention of the continuing improvement in the standard of play but, noticeably, not at the expense of any deterioration in on-court behaviour. Special praise was reserved for Elspeth Whitelaw, Christine Lawrie and Gareth Stott, without whose organisational abilities there would be no BCJ tournament. A new presentation for this year, was made to four players for their loyal commitment to Junior Tennis in the Borders. Nik Stingl (Kelso), Sean Berthelsen, Kirsten Begg and Rory Shaw (all West Linton LTC) have all been regular annual competitors at this event throughout the last 10 years and this was their last Borders Confined event. Eddie Brogan (Borders Tennis Junior management committee) commented on the passion, enthusiasm, commitment and sportsmanship they all had exhibited over the years and hoped they would continue these traits into their adult tennis career.